If you've tried an internet search on how to apply eye makeup, you will likely get millions of websites in your search results. You could make yourself crazy trying to follow the advice of several authors, or websites, or companies, and then try to compare them to each other to see who is correct. My best advice for you is to find an expert whom you like and stick with that person's advice. 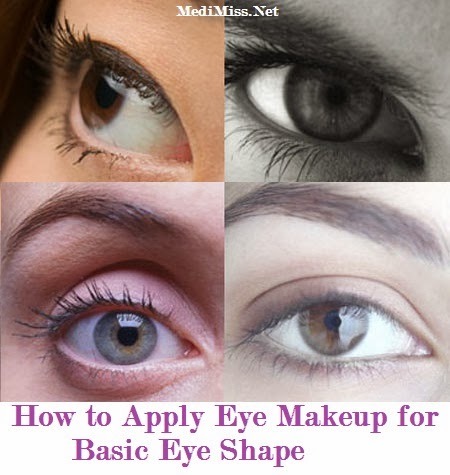 How do you know if you have a basic eye shape? The basic eye shape is where the eyelid follows the shape of the eye, is easily seen, and creates a crease between the eyelid and the area below the browbone. You may be told that your eyes look "normal" and that is because not one area is more prominent than another. 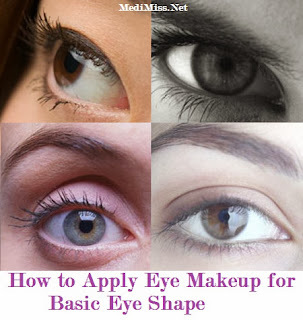 To apply makeup to a basic eye shape you need to use three different eye shadows. Yes, three. To get a perfect, well-blended look, three is the minimum. Some different eye shadow application techniques may require more. If you use only two, your eye makeup will look flat and lack depth. The lightest color you will use is called the highlight, the medium color is the midtone, and the darkest is the accent, which is usually used sparingly. First, you will use your highlighter shade over your eyelid and across your browbone (just under your eyebrow). Next, you will sweep the midtone shade across the crease of your eye starting from the inner third of your eye and outward to the edge of your eye. Lastly, you will use your accent shade in the very outer third of your crease, then sweep the accent along your upper and lower lashline going only a third of the way in. This technique is good for those whose eyes are spaced perfectly. What if your eyes are set narrowly, but you still have a basic eye shape? You will be especially careful not to bring the midtone eye color in towards your nose. You will keep the midtone shade on the outer third of your crease, blending it in towards your nose only as far as half way - depending upon how close your eyes are set together. You can extend your midtone shade past your outer eye a little. This technique will help pull your eyes further apart. What if the opposite is true for you - that your eyes are set wide apart? You will do the opposite above and use your midtone shade starting from the inner corner of your eye and sweep it outwards along the crease, but not going into the outer third region of the crease. This will help bring your eyes closer together. As for the accent color, you will still use it along your upper and lower lashline, but use it starting from the inner corners of your eye and working it outwards, never going past the outer corners of your lashline. To get your eye makeup colors to blend perfectly, you must use appropriately shaped brushes. There is another benefit of using eye brushes versus using a sponge-tip applicator or, heaven forbid-- your fingers! That benefit is brushes are gentler on the delicate skin of your eyes. They don't pull or tug at your skin and help blend the colors beautifully. If you can avoid using your fingers to hold your eye in place, you avoid stretching out that delicate material and causing premature wrinkling around your eye. Practice applying makeup without tugging on your eyes and just use tools to apply your eye makeup. You may need to get a mirror that tilts, or a hand held one so as not to crink your neck to position your head correctly when applying your makeup. Here's some last words of advice: Remember that makeup on bad skin looks like makeup on bad skin. So take care of it so people will notice your eyes more instead of being distracted by your skin's imperfections!